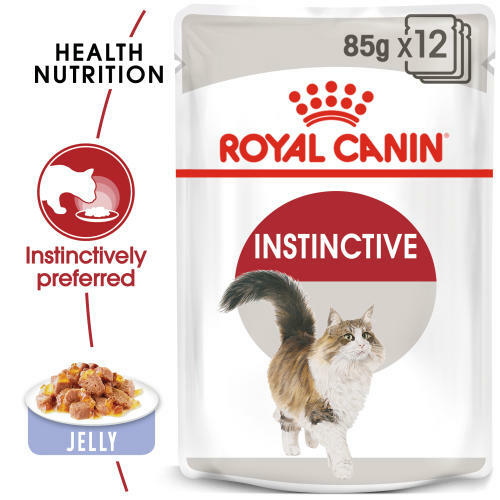 ROYAL CANIN Instinctive Adult In Jelly Wet Cat Food is both scrummy and nutritious! Finding food for your cat that is both nutritionally beneficial and appetising can sometimes be a difficult task. Cats can be fussy, and often won’t eat food if it isn’t to their palatability – even when it’s tailored to include the nutrients your cat needs. ROYAL CANIN Instinctive in Jelly is formulated to match the optimal Macro Nutritional Profile instinctively preferred by adult cats. With carefully selected nutrients included for optimal palatability maximum scent and taste, the end product is a dish that your cat simply won’t be able to resist. Thanks to the inclusion of a vast assortment of vitamins, minerals and amino acids (all needed to maintain general health and regular growth), your cat will be consuming a highly-digestible and nutritionally-balanced food. The combination of nutrients has not only been designed to be instinctively edible and nutritionally healthy, they’ve also been formulated to help your cat maintain an ideal weight and support a healthy urinary system. ROYAL CANIN Instinctive in Jelly contains an optimal level of fat content for proper regulation of energy levels and weight maintenance. Additionally, the fibre blend and protein contributes to the feeling of being full. To cater to each cat’s individual preferences, ROYAL CANIN Instinctive is also available in delicious gravy or as a tasty loaf. Instinctively preferred - Formulated to match the optimal Macro Nutritional Profile instinctively preferred by adult cats. Maintains ideal weight - Formulated to help maintain ideal weight. Additives: Vitamin D3: 100 IU, E1 (Iron): 4 mg, E2 (Iodine): 0.3 mg, E4 (Copper): 2.5 mg, E5 (Manganese): 1.2 mg, E6 (Zinc): 12 mg. Composition: Meat and animal derivatives, vegetable protein extracts, derivatives of vegetable origin, oils and fats, minerals, various sugars. Crude ash: 1.5%. Crude fibre: 0.8%. Crude oil fats: 4.5%. Moisture: 0.8%. Protein: 11.8%.